Growing up on Baker’s Mountain back in the days before internet, electricity, or even running water holds many precious memories I would not trade for anything! My grandma was born in 1890, and my mom in 1921. I was born in 1942, a year after our nation entered World War 2. Humphrey Bogart and Catherine Hepburn portrayed fast and glamorous lives on movie screens, but time moved slower in the North Carolina mountains in those days. My youngest grandson was born in 2014-he will learn some of the most primitive means of running a household, and he will know the traditional ways of surviving and thriving on our land. It’s uncommon in this time to take the time, to make the effort to connect to history and our land, and I’m very happy to pass this on to my grandchildren. They play with iPads, but they also play in the dirt, and know where they came from. Today I’m thinking back on my Grandma’s wash pot that she kept down by the stream. Folks in big cities had ringer washing machines by then, but those wouldn’t find their way to these hills for quite some time. 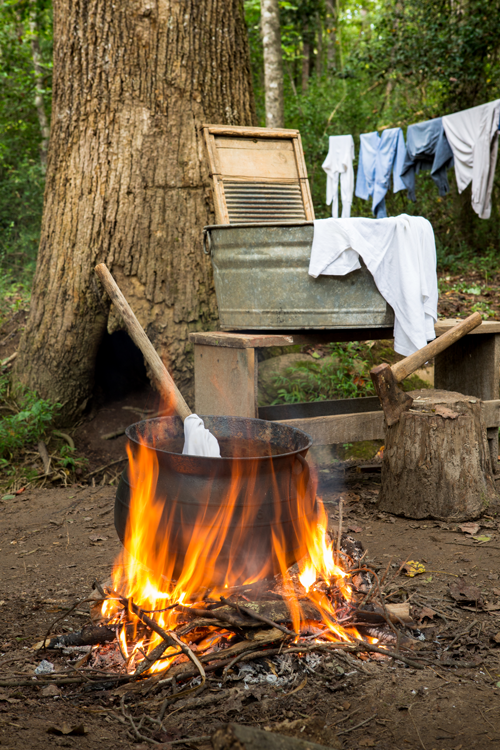 On laundry day, Grandma would build a fire under that pot and fill it with water from the stream. The white laundry went in first, along with some homemade lye soap. She’d stir it occasionally with a long stick until the water heated up just so-she always knew just when-and then she’d use that stick to pull out a piece of clothing. She’d scrub it on her washboard until it was clean, then rinse it in clear cold water. She’d hang each item on a line strung between the trees. I loved watching them blow in the breeze. Grandma made her lye soap in that same black iron pot. I remember her mixing ashes, animal fat and Red Devil lye, and I can still smell the bubbling mixture today. She used this soap for all of her chores, even bathing and washing our dishes. It was also the go-to for bug bites and poison ivy. We used it for just about everything. In those days, people even used lye to plump up hominy, and they sure seemed to think it was delicious. I always refused to eat hominy though because I knew that the Red Devil Lye can had a skull and crossbones on it and it didn’t seem sensible to eat it.